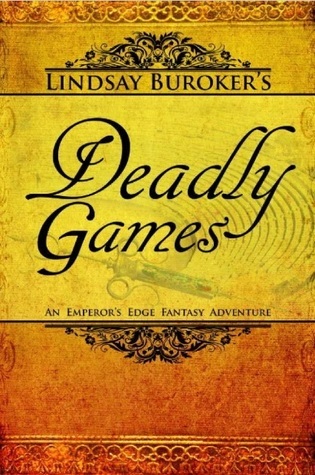 Deadly Games is the third in Lindsay Buroker's Emperor's Edge novels and I swear they keep getting better. This time, Amaranthe Lokdon and her gang of mercenaries are interested in who is taking the athletes competing in the Imperial Games. They have to be pretty powerful, because they take two of Amaranthe's men. Including the world-renowned assassin Sicarius and that wrecks all sorts of damage to Amaranthe due to her love for him. I loved this, maybe better than the second book, because we start to really see the tension between the members of the Emperor's Edge. There's the romance between Amaranthe and Sicarius, whom the latter does nothing about, and the difference of objectives start to show. Amaranthe and Sicarius want to get in the Emperor's good graces - the others either want to kill Sicarius, have fun, or take off to find a proper magic teacher. It's all so wonderful to watch develop. And the world Buroker builds! Steampunk based, the Imperial Games have obstacle courses filled with steam powered traps, with a well thought out culture not only of the city and country this series takes place in but also it's neighbors and how the interact. Every chapter, I fall more in love with this world and can't help but smile at something one of the characters says or does. I breezed through this, wearing my headphones while I did house chores.